König von England (1600-1649). Document signed ("Carolus R."). Westminster. Lateinische Handschrift, Kalligraphie und Kupferstich (Herrscherportrait) auf Pergament. Ca. 600:510 mm (bei eingefalteter Plica). Durchzogener Pergamentstreifen erhalten; es fehlt das Siegel. 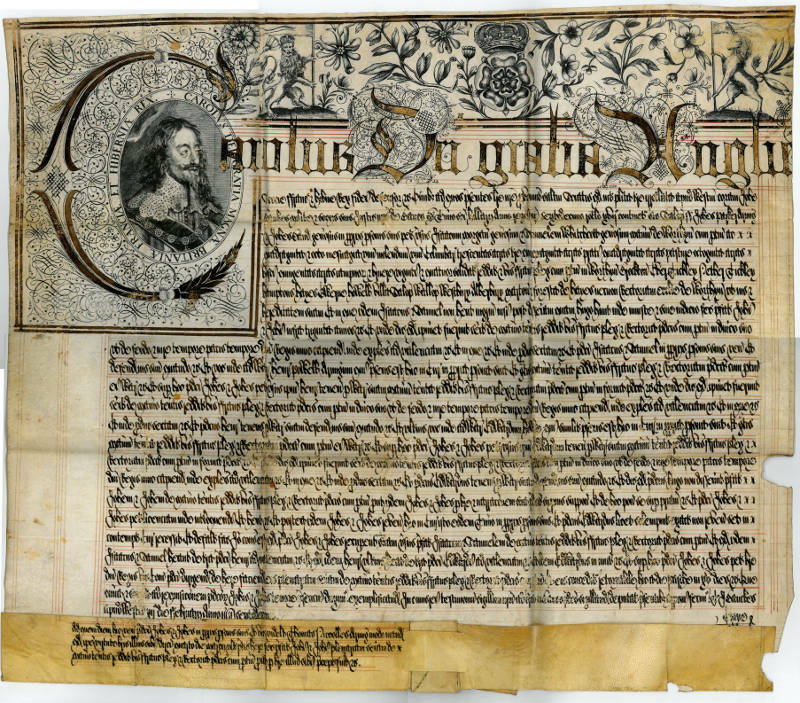 Royal exemplification for the legal transfer of a property, the manor Worthen in Shropshire (Salop) with all its appurtenances, including a mill, messuage, land, meadows, pastures, woods, and parts in Brockton, Over and Nether Tickley, Hampton, Hayes, Ewerne, Westbury, Alberbury and Marton, as well as the rectory of the church of Worthen. Isaac Morgan and Samuel Whitehall were the owners and sellers. As the property was entailed, selling it to Messrs. John Parker and John Sand necessitated a roundabout procedure - a collusive action known as a "Common Recovery", in the course of which the purchasers would claim their alleged inheritance in the Court of Common Pleas from a fictitious third party. As this party failed to appear in court, the claimant would win the case by default, "barring the entails", and the property so acquired became a free allodium. 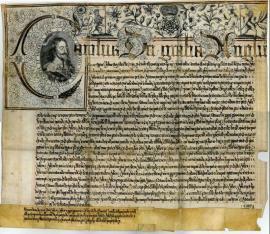 The present royal document constitutes a so-called "Exemplification of a Common Recovery", a formal transcript of the proceedings in the monarch's name, using an elaborate script imitating a medieval chancery hand (we are indebted to Mr Michael Webb, of the Bodleian Library, for his valuable assistance in cataloguing this item). The following year marked the beginning of the Civil War; in January 1649, Charles I was sentenced to death by Parliament and executed for High Treason. - Ink rubbed in places, otherwise well preserved. Folded..